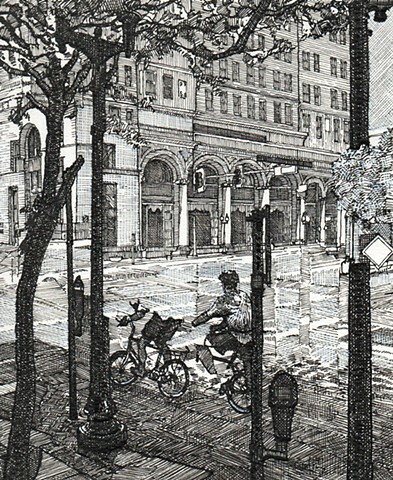 This drawing is done from multiple views of a street corner in downtown Cedar Rapids, Iowa. The view is shifted slightly from one position to another throughout the scene, mixing and merging different elements to create a new view that is slightly distorted. I was interested in the way the objects in the scene overlap each other and are broken and disconnected along fissure-like lines.... the way fault lines from an earthquake shift the terrain along a slight break in the surface of the earth. This was further enhanced by the cross hatching and directional lines in the drawing, which accentuate the planes of the surfaces in the space and the surface of the picture plane. When cycling, if the chain on your bicycle suddenly breaks or drops off it creates a sometimes jarring break in concentration and in the rhythm of the ride..... one moment you are fully absorbed in your travels, and the next you are completely stopped and faced with an unexpected confrontation with the mechanics of your bike.